27½-29 Massachusetts is located on the west side of Massachusetts Avenue, between Beacon and Marlborough, with 25-27 Massachusetts to the north and 31 Massachusetts to the south, across Alley 908. 29 Massachusetts Avenue was designed by Snell and Gregerson, architects, and built in 1889 by Webster, Dixon, and Company, masons, as the home of Brooks Adams. He is shown as the owner on the original building permit application, dated January 14, 1889, and on the final building inspection report, dated September 18, 1889. The original address of the house was 464 West Chester Park; it changed to 29 Massachusetts Avenue when West Chester Park was renamed on March 1, 1894. Brooks Adams purchased the land for 29 Massachusetts Avenue on December 29, 1888, from Henry Lee, H. Hollis Hunnewell, and Augustus Lowell. The land was part of a larger parcel that Henry Lee and his partners purchased on February 20, 1883, from a real estate investment trust formed by Grenville T. W. Braman, Henry D. Hyde, and Frank W. Andrews. The parcel was one of several tracts of land the trust had purchased from the Boston Water Power Company on March 1, 1872. Click here for an index to the deeds for 27½-29 Massachusetts Avenue, and click here for further information on the land west of Massachusetts Avenue between the south side of Beacon and the north side of Commonwealth. Brooks Adams married in September of 1889 to Evelyn Davis and, by the 1889-1890 winter season, they had made 29 Massachusetts Avenue their home. He previously had lived at 57 Mt. Vernon with his parents, Charles Francis Adams and Abigail Brown (Brooks) Adams. Brooks and Evelyn Adams also maintained a home in Quincy. He was an attorney. During the 1890-1891 winter season, they were joined by Miss Mary Quincy. She had lived at 229 Beacon during the previous season. Mary Quincy was the sister of Henry Parker Quincy, who was married to Brooks Adams’s sister, Mary Gardner (Adams) Quincy. By the next season, she had moved to 589 Beacon. On November 9, 1893, Brooks Adams transferred the property into his wife’s name. The Adamses continued to live at 29 Massachusetts Avenue during the 1894-1895 winter season, after which they made Quincy their home. During the 1895-1896 winter season, 29 Massachusetts Avenue was the home of Mrs. William M. Read. On July 13, 1896, 29 Massachusetts Avenue was purchased from Evelyn Adams by attorney William Sohier Dexter. He was a widower and lived at 18 Exeter. 29 Massachusetts Avenue became the home of his son and daughter-in-law, Philip Dexter and Edith (Wood) Dexter. They had married in April of 1895. Prior to their marriage, Philip Dexter had lived with his father at 18 Exeter. He was an attorney. 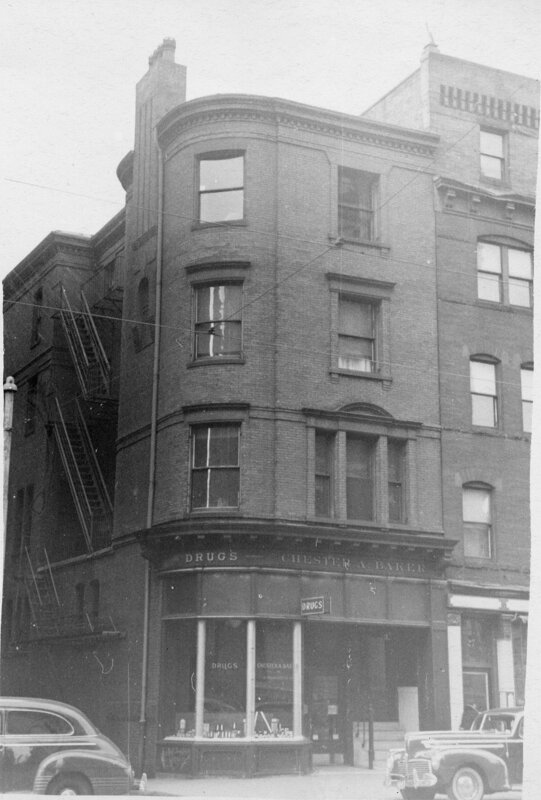 The Dexters continued to live at 29 Marlborough during the 1909-1910 winter season, but moved thereafter to 65 Marlborough. 29 Massachusetts Avenue was not listed in the Blue Books after 1910. William S. Dexter had died in September of 1908 and on January 25, 1911, 29 Massachusetts Avenue was purchased from his estate by real estate dealer James Sumner Draper. On March 28, 1911, 29 Massachusetts Avenue was purchased from J. Sumner Draper by Dr. Walter Channing, a physician and psychiatrist. He and his wife, Anna Kast (Morse) Channing, lived in Brookline. 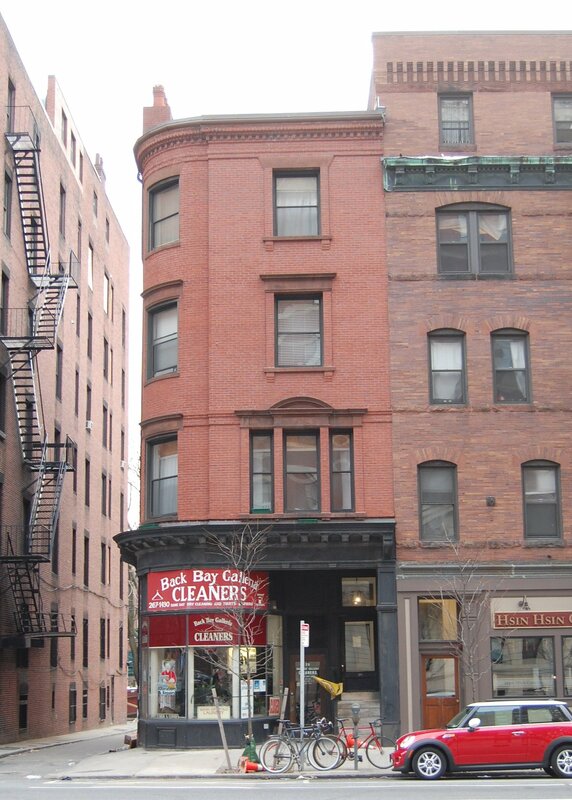 The transaction was reported in the Boston Globe on March 31, 1911, which noted that Dr. Channing “will improve the property for business purposes.” His son, real estate dealer Walter Channing, Jr., represented him in the transaction. 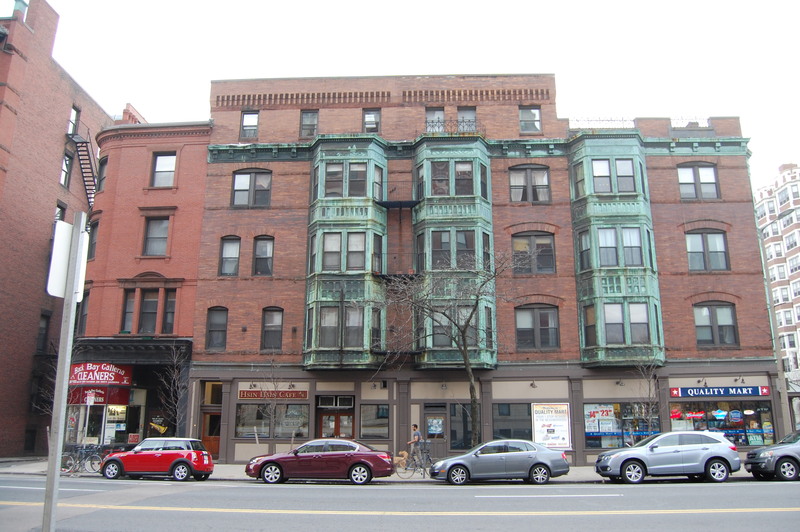 It was probably during this period that 29 Massachusetts Avenue was converted from a single-family dwelling into apartments, with an address of 27½ Massachusetts, and a storefront, with the address of 29 Massachusetts Avenue. Walter Channing maintained a private sanitarium in Brookline, adjoining his home. In 1913, he planned to move the sanitarium to Wellesley and, in order to finance the move, on April 25, 1913, he created a real estate investment trust, with his son, attorney Henry Morse Channing, as trustee, and transferred 27½-29 Massachusetts Avenue to the trust. On June 30, 1913, 27½-29 Massachusetts Avenue was purchased from Walter Channing’s trust by Chester A. Baker. 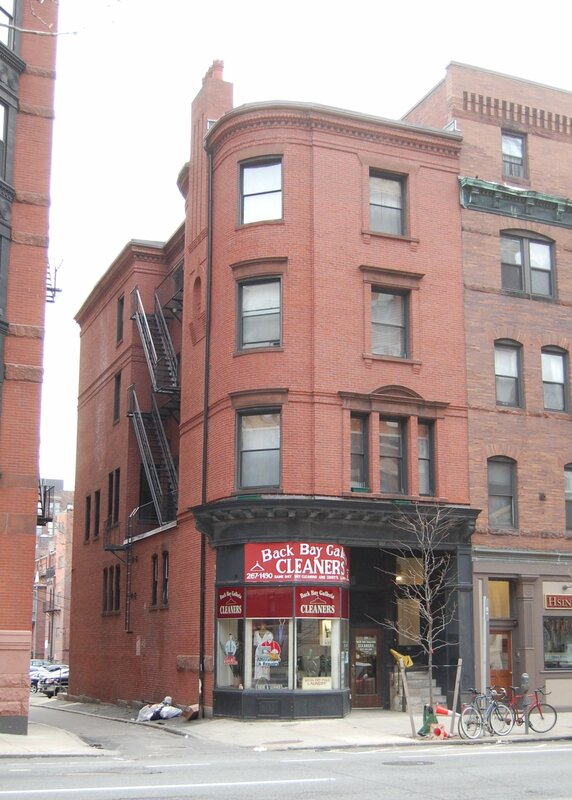 Chester Baker was a retail druggist and maintained his store at 29 Massachusetts Avenue. He and his wife, Florence M. (Pickering) Baker, lived at 13 Haviland and later in Brookline. Chester A. Baker, Inc., continued to operate a drug store at 29 Massachusetts Avenue (and at several other locations in the Back Bay) until the mid-1970s. Charles Baker retired in 1943. On December 1, 1945, 27½-29 Massachusetts Avenue was purchased from Charles Baker by the Meshar Corporation. Julius Melnick, president of Meshar Corporation, and Joseph V. Argus, its treasurer, also were officers of Charles A. Baker, Inc.
On December 30, 1948, 27½-29 Massachusetts Avenue was acquired from the Meshar Corporation by Joseph V. Argus, Julius Melnick, and his brother, David Melnick. On August 11, 1952, Joseph Argus sold his one-third interest in 27½-29 Massachusetts Avenue to George W. Gold, and on March 16, 1953, Julius and David Melnick acquired his interest. On May 31, 1972, Julius Melnick sold his one-half interest in the property to David Melnick, who by the early 1970s, was president and treasurer of Charles A. Baker, Inc.
On April 4, 1978, 27½-29 Massachusetts Avenue was purchased from David Melnick by Aaron Rybak and his wife, Joanne Ruth (Kopelow) Ryback. He operated the M. J. Reinhardt locksmith company at 29 Massachusetts Avenue. On October 13, 1982, they transferred the property to themselves as trustees of the 27½ Mass Ave Real Estate Trust. 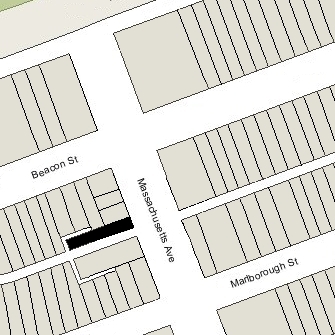 On June 3, 1985, 27½-29 Massachusetts Avenue was purchased from the 27½ Mass Ave Real Estate Trust by Christine Curran, as trustee of the Bryar Real Estate Trust. On January 30, 1986, the property was acquired from Christine Curran by Donn O’Connell. In July of 1989, he applied for (and subsequently received) permission to convert the store space into a dry cleaners and laundry. The building continued to have six apartments. On March 16, 2000, Donn O’Connell transferred 27½-29 Massachusetts Avenue to the Donn O’C – 29-27H Massachusetts Avenue LLC, of which he was the manager of record..
27½-29 Massachusetts Avenue remained a residential and commercial building in 2018.